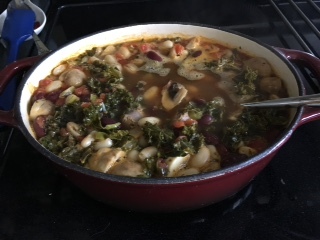 Since the season of cold blasts of air is upon us, of course it's mingled with beautifully colored leaves quickly abandoning the trees, it's a good time for some homemade soup! My favorite soups all fall into the hearty range. I like them bold, chunky and with lots of flavor. 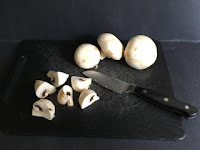 I'm always on the prowl for new soup ideas as I tend to overuse each new one until I need something totally different. But this is one I've used over and over again, so many times that I'm not really sure where it all started. 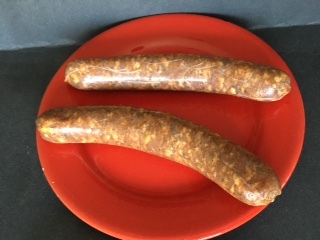 Each time I try a different type of sausage and I also like to play around with the beans and mushrooms. Lots of room for experimenting. And, you'll need to play around with the amounts, especially for the sausages. 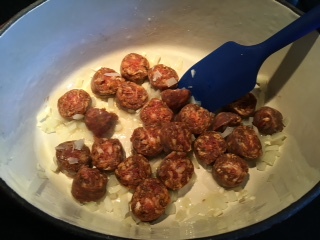 This time I used two large Chorizo sausages (love the heat!) and that worked out just right for servings for five. 1. Slice the sausages into bite-size pieces. 2. 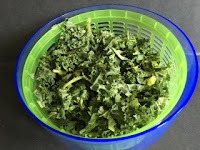 Fold the stalks of kale in half lengthwise and remove the stem. Then tear the leaves into pieces. 3. Slice and dice the onion and garlic while heating the olive oil in a large pot. Add to the pot and heat until the onions are translucent. 4. Add the sausage and kale to the onion mixture and cook for 5-6 minutes. 5. 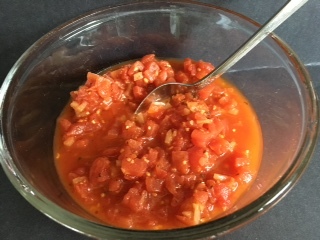 Stir in the chicken broth and tomatoes. Add the kale, tumeric, and rosemary sprig. Bring to a gentle boil and allow to simmer for 25 minutes. 6. Add both types of beans and continue to simmer for at least 5 minutes more. Serve with your favorite bread or dinner roll. 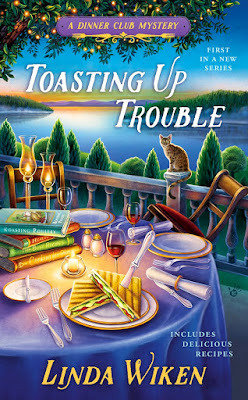 For a chance to win a signed copy of TOASTING UP TROUBLE, leave a comment telling me what is your favorite soup recipe! 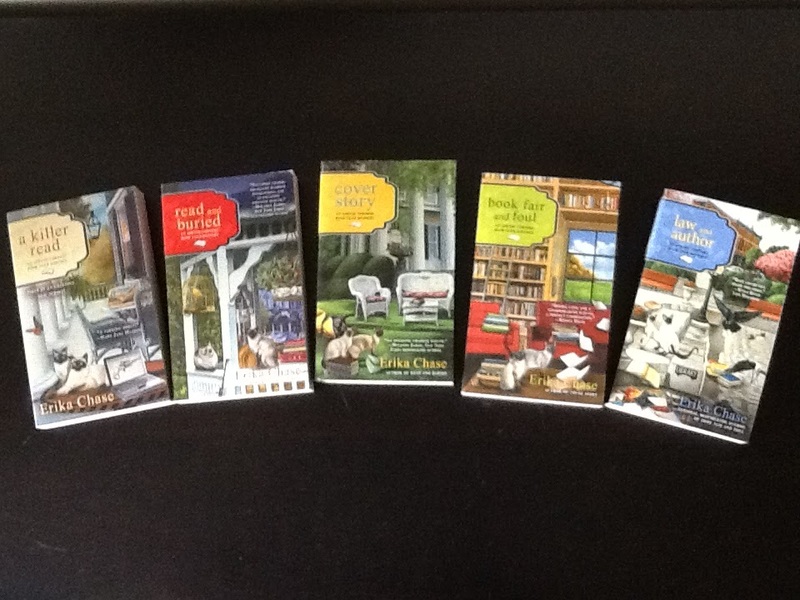 Winning name will be drawn Friday at 5 p.m. EST. 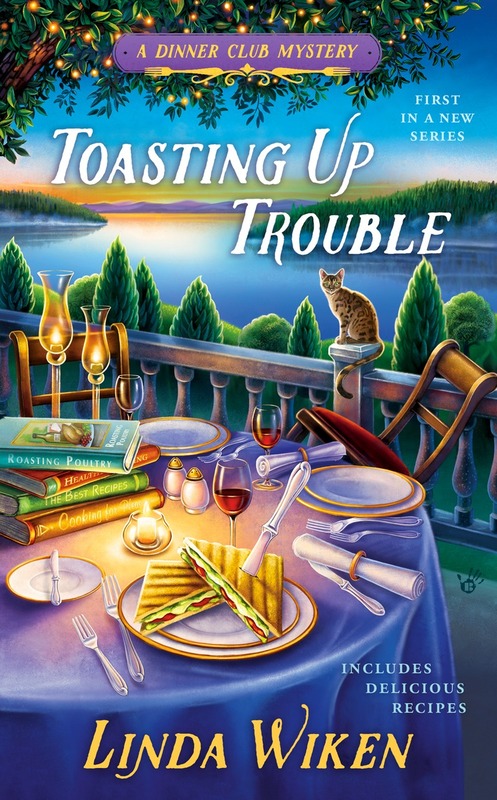 The first in the Dinner Club Mysteries is now available at your favorite bookstore and on-line, as a paperback and as an e-book. Recipes included! Sounds like the ideal comfort food, Dianne! I make a vegetable barley soup with either lamb or chicke. 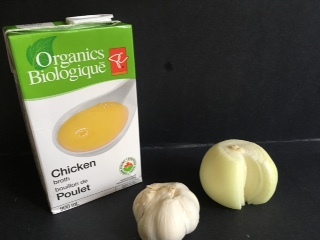 I just use either beef or chicken broth depending on the meat. I like the sounds of this one, Sandy! I love love LOVE Garden Vegetable soup! I hadn't thought of combining rosemary and turmeric. Clever. Do you mean to rinse and drain the canned beans? Glad you caught that, Libby. It's been added! Thanks. My pleasure. Want you all to know that I really look at the recipes! 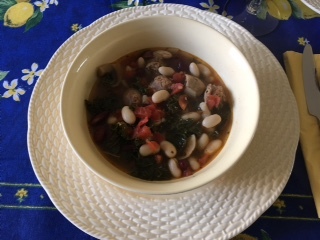 My favorite home made soup which I make for family and friends is tomato vegetable soup filled with love and wonderful veggies. Ah, the secret ingredient -- love! Thanks! There's that chicken soup again, always a winner. Thanks, Melissa. Mom's recipes always seem the best. That suggests a certain tang, too. Thanks for sharing, Becky. Love this idea!!! Thanks, Kathleen. I'm a canned soup senior - tomato and clam chowder! Sounds tasty for sure, Karen. I'm a big fan of chili, also. Sounds like your hubby's a keeper! My Mom's home made chicken soup.She made it for me many times when I was sick. Always made me feel better. Thanks for the chance to win this 1st book of yours in a new series. Can't wait to read it!! Thanks for commenting, Nancy. I'm thinking the chicken soups are winning. Sounds like total comfort for a cold day, Celia.